Great opportunity on this unique remodeled home. Move in ready home all recently remodeled. Gorgeous brand new kitchen features open floor plan and island with breakfast bar top. Also has tiled backsplash. Maintenance free flooring throughout home. Woodstove can heat the home but you also have natural gas furnace too. Unique storage spot for the wood is in the silo with door for access from inside the home....no need to go outside to get wood. New bath has granite counter and undermount sink. Laundry is tucked under the stairs for efficient use of the space. Each upstairs bedroom has its own balcony. 1 car detached garage and a large pole barn. Sits on over 1 acre of mature trees for scenic views and privacy. Located very close to the paved part of Barnes lake rd. Will likely not last long...call me on it now! 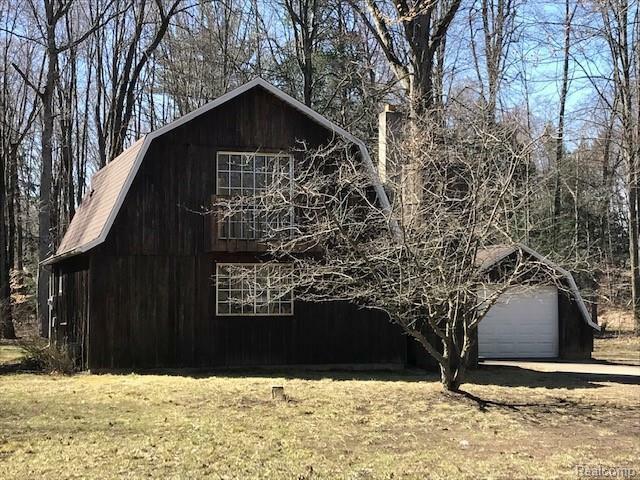 Seller will fix rear pole barn roof so that financing can be procured.